Julian Castro, former mayor of San Antonio and former Secretary of HUD, speaks during as part of the Distinguished Speaker Series at the Performing Arts Complex on the campus of the University of Texas Rio Grande Valley on Sept. 27, 2017 in Edinburg. 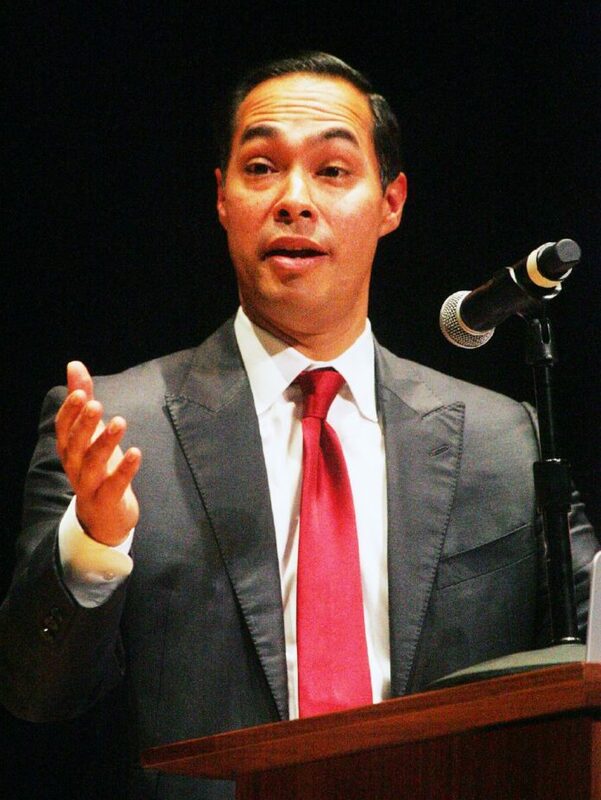 EDINBURG — Former San Antonio Mayor and Obama administration cabinet member Julián Castro launched the Distinguished Speaker Series at the University of Texas Rio Grande Valley on Wednesday in front of students, area residents and local elected officials. Castro, 49, was the youngest elected mayor of a Top 50 city in the country and was the first Latino to deliver an opening keynote address at the 2012 Democratic National Convention. He was appointed secretary of Housing and Urban Development by President Barack Obama in 2014. He is now a Dean’s Distinguished Fellow at the University of Texas LBJ School of Public Affairs in Austin as well as fellow of the Dávila Chair in International Trade Policy. During his speech at UTRGV, he encouraged students to trust their instincts, push to reach higher and surround themselves with supportive people. He used his own story and background coming from a family of immigrants to connect with the many first-time college students in the region, praising the many opportunities he and his twin brother Joaquín Castro had that led them to become lawyers and a political career. Part of those opportunities included Pell grants and student loans, he told the audience, and this opportunity allowed the country to transform to meet the needs of the 21st century, he said. Universal healthcare, he said, is one of those opportunities that need to be secured in today’s America he said, as well as universal pre-K to make sure everyone has the same chances to succeed in life. “Today our country finds itself in unprecedented competition for jobs and for investment with countries around the world that are rising and producing tons and tons of young people with the intelligence, and the ambition, and the creativity, and the innovation to be able to produce the ideas and the companies that are going to drive prosperity,” he said. What this means is that communities that are able to produce this brain power will thrive, he added, and those that don’t are simply going to fall behind. So the investment in education, training and other educational opportunities is imperative to fill 21st century jobs, he added. As for those who were in attendance, Castro congratulated them for having already succeeded at pushing themselves to seek an education that will one day lead them to become that brain power. The Rio Grande Valley, he said, reflects the tremendous potential of the entire state and the nation for its growing young, bilingual, bicultural population.